Lately I've been having dreams of long rides in the country in warm weather. Took the Rawland out to Depot Park today, in shorts and short sleeves, and that pretty much did the trick, at least for now. Back when I used to ride, bikes were steel and February was cold and there was ice. 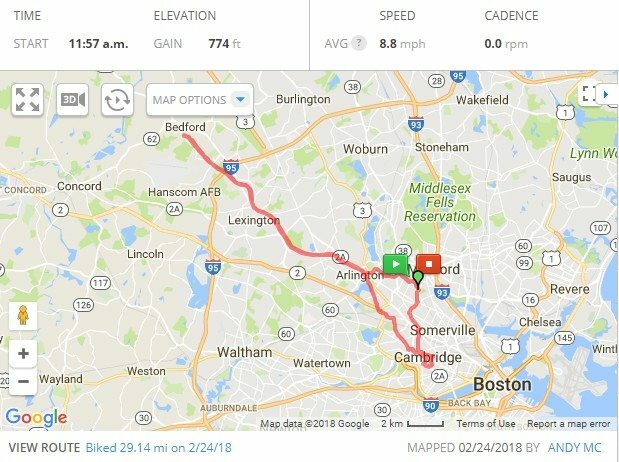 Now that I am old and there is new tangled warm weather I went out for a 20 mile loop through Sherborn, Holliston and a bit of Hopkinton. First tried going south to Millis but the road was blocked by a tree that fell and took out a utility pole. The only ice is on my aging hip, very nice to get out and it nice to post a ride with y’all. As usual, you've arrived before us. I delighted in yesterday's summery weather with my cross bike last night. Full summer kit and I covered my usual nice weather route instead of the cold weather 20 or 25 mile abbreviated versions. 117 through Lincoln is downright dreadful as is sections of Monument st in Concord/Carlisle. I equate them to bombed out runways. Especially in the dark where the 38's are managing them far better than the 25's or 28's on my road bikes. Despite zig zagging I've managed to hit a few. Had an absolute blast this afternoon on the Crimson bikes shopride from Cambridge to Bedford via the minuteman, what a great a bunch of people. Will definitely be doing more group rides in the future. I ended up doing just under 30 miles roundtrip including cycling to/from my homebase in Medford. Looks like a good trip. I have only one beard and if you'd seen up you'd have recognized our vintage blue tandem which is visually more memorable than I am. Ah, Rod Holland has a beard but his is a different color from mine. We rode 40 miles from home in Waltham to Alewife, out the MM, over to Great Meadows for a picnic. It started warm, seemingly got colder when the sun went away. Then Accuweather said rain would start in 7 minutes while we were eating. Hmm, the rain didn't happen, except for a few drops on our way home. The picnic was great though. 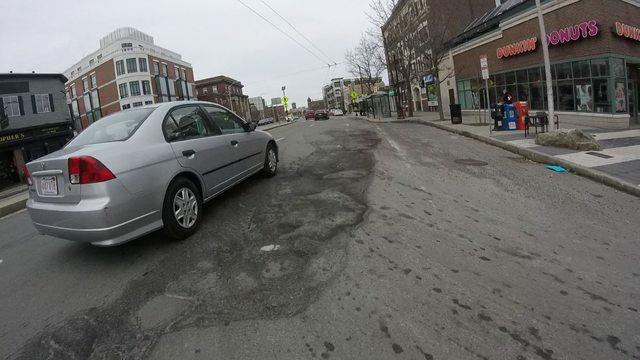 UPDATE - unfortunatelty no pics, but the temporary pavement patches at Porter Square have FAILED. Not bad, dangerous. It's amazing what a decade will do, isn't it? 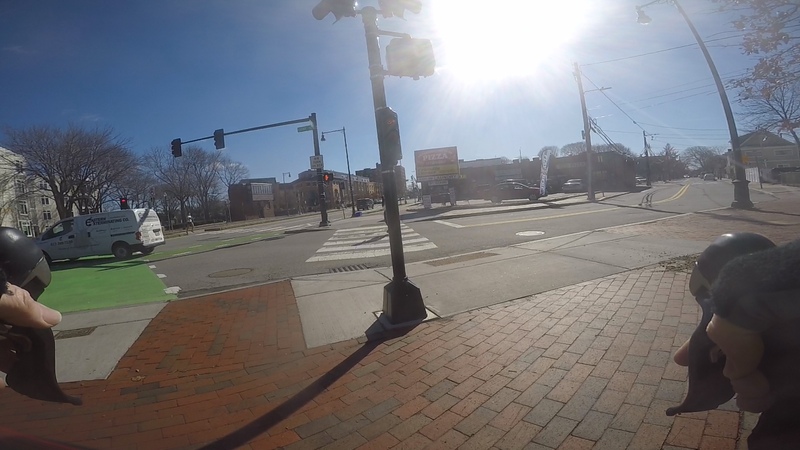 The slowly moving "Porter Square Intersection Improvements" probably means that they'll have to do a resurface (ala Beacon Street in Somerville) only to rip it all out in short order. After a decade, the blunder of the Porter Square Shopping Mall left-turn only exit is finally being undone. However, the taxi stand that is never used (it's been years since I've seen a cab there) will remain. But may diety help anyone walking the new everlasting crosswalk on the south side of Mass Ave. If use is a token of love, then my old 700c Long Haul Trucker is my best loved bike, with ~12K miles to show for it. Back in August, I managed to round the seatpost constrictor binder bolt through an excess of zeal. I made a number of attempts to drill that out over the intervening months, until I finally took a Dremel to it on Thursday, cutting through the binder bolt (and the constrictor) with a shower of sparks (no picture of that, but it was dramatic), punctuated by a satisfying "POP!" when the bolt gave up the ghost (I really had torqued that sucker down...). I replaced the defunct constrictor with a Paul QR Seat Post Collar: no more bolt rounding for me, at least not on that bike. I took the LHT out for a spin up to Depot Park this afternoon, temperatures falling from the mid-50s to the upper 40s. The LHT is still set up with Compass Snoqualmie Pass Extralights (normally, at this time of year, it would be wearing studded Schwalbes, but I seem to have spared myself that indignity through my procrastination), and floated along with pneumatic suspension to burn. Nice ride, and I rediscovered what I love about this bike, and these tires. Something new in Lexington: some of the Minuteman intersections now have YIELD signs, instead of STOP signs. This feels like progress, if only because it more closely corresponds to actual rider behavior. Got a good look at the beaver dam in Tophet Swamp. Had a couple of encounters with black squirrels, this one near Revere Street, Lexington. I headed out around noon time, shortly afterwards the sun was obscured by the grey clouds. It was still a gorgeous 58 mile ride on my newish cross bike. I managed to get my first flat of 2018 in Sudburry. I stopped and walked about 100 yards backwards to a park/ baseball field with benches. After a few minutes and about 100 pump strokes I was back rolling. Eventually I made it to Maynard where I stopped at Ray and Sons bike shop to get another patch kit for just-in-case of another mishap today. The guy in there is very friendly and nice. He blessed my R3 with holy water a few years ago when I stopped in for the same reason as I did today. Despite that the frame still broke last year. I must have crossed paths with a dozen or so riders but no familiar beards or faces. I did engage in a fun and impromptu "street race" in Stow with 2 other roadies who I can assume also enjoyed the spirit of the moment. As I rolled into Acton I had an oh-crap moment as I felt a few drops. Mid 40's with no rain gear and miles from home can be daunting. Thankfully steady rain never materialized. 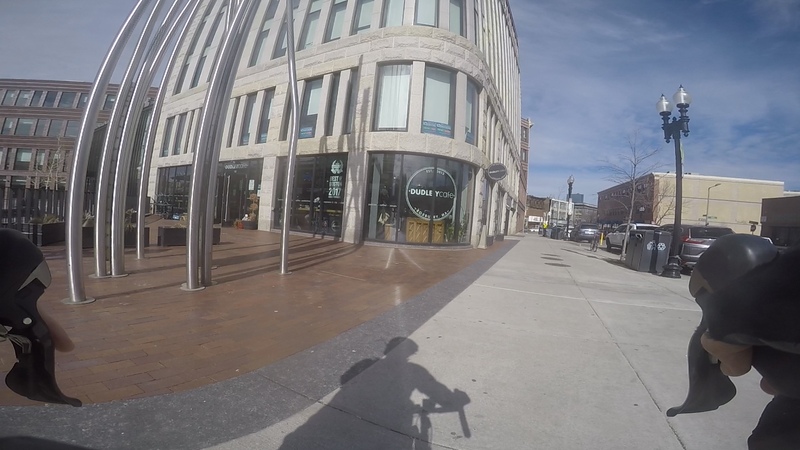 Eventually I rolled through Concord Center and on up Lowell st with thoughts of taking a break at Ferns on my mind. Instead I continued on towards home feeling strong enough to get home before bonking. A few more smiles and waves to be shared before the glorious moment of opening the garage door to revel in an afternoon well spent. The lines completely gone now because of the temporary work or have the potholes completely returned? I'll try to check it out the next time I'm that way, won't be tomorrow due to the weather tho. Last edited by anx; 02-24-18 at 08:17 PM. Did you notice the new directional sign in Bedford on the bike path that helpfully tell you the distance to Arlington and Alewife? The problem? The sign is pointing towards Concord, not very helpful for anyone not familiar with the area. The group I was out with today considered how we could 'turn it around' but without the right tools it was a lost cause. Around the area of westview st I think looking at google maps incase anyone is in nearly that area than I and wishes to correct it. I'll pass that along to the Lexington folks. Really Two-Stage Turn Queue Boxes. Anyhow, it's nice to have a green box there now. 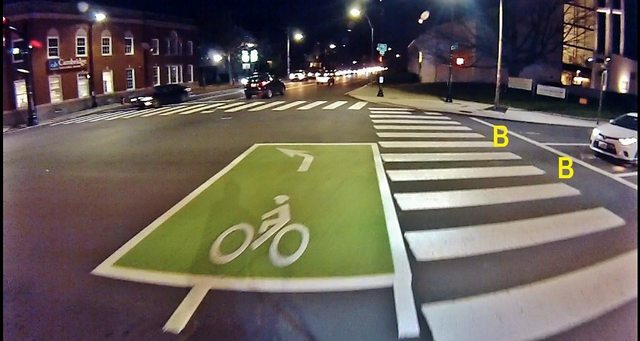 for bikes going straight, they can use that box too, correct? I don't see why not. 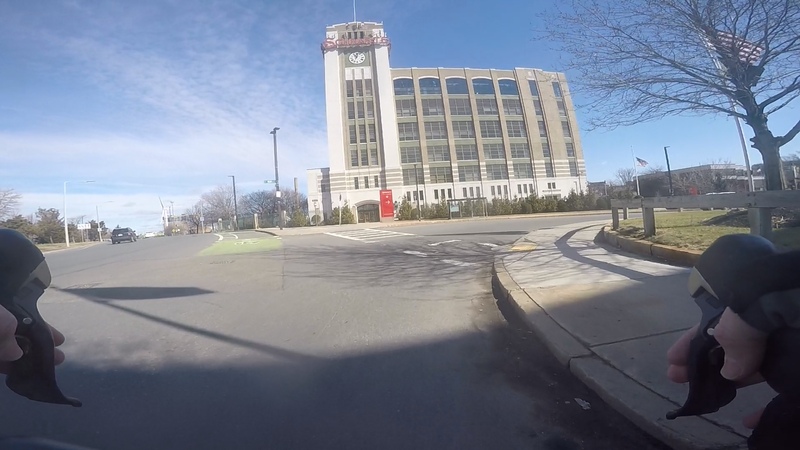 The thing is, if you watch the stoplight and scoot along promptly toward the bike lane by the curb (on the far left and not visible in the picture) when the light changes you don't impede the drivers at all. It isn't so different from just stopping at those B points, except for two things. 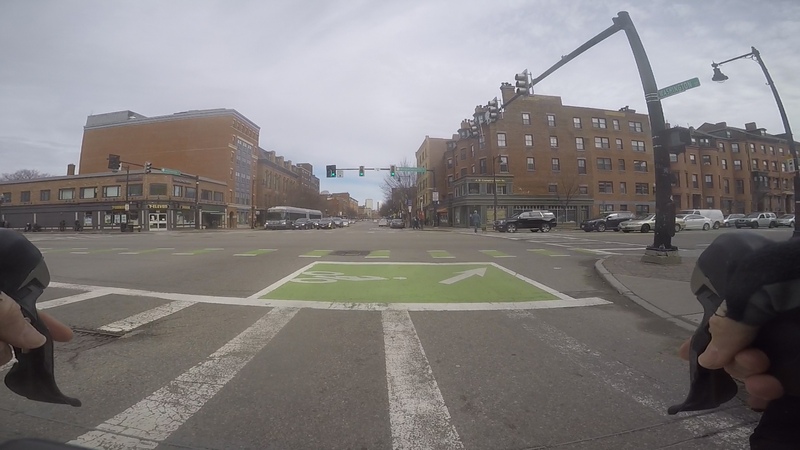 The green box gives your being there legitimacy, and by starting that much farther out in front of the cars you have time to get out of their way before they even get to the box. Everybody wins and they don't get (too) impatient. Of course all that works only if you don't dawdle too badly. Everybody wins and they don't get (too) impatient. Of course all that works only if you don't dawdle too badly. Took the LHT on the North Bridge loop, the muddy version that uses Reformatory Branch outbound. Beautiful day, temperatures climbing into the low 50's before slipping down again. A couple out for a stroll pointed out this bike to me. They say it has been abandoned for a couple of days. There is damage evident on and around the rear wheel (bent spoke, at least, probably more). It's sitting in Concord, on the Reformatory Branch, between the Great Meadows and the Water Treatment access roads. I came out of the trees, and the sun came out from behind the clouds. 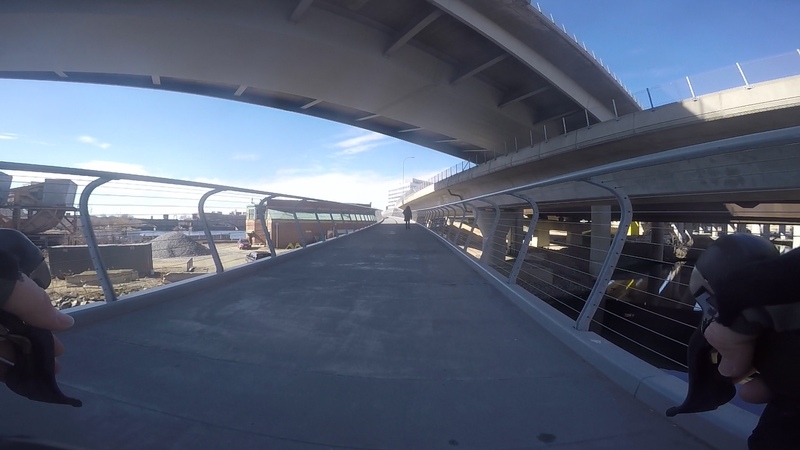 Crossing the Concord River, Monument Street. 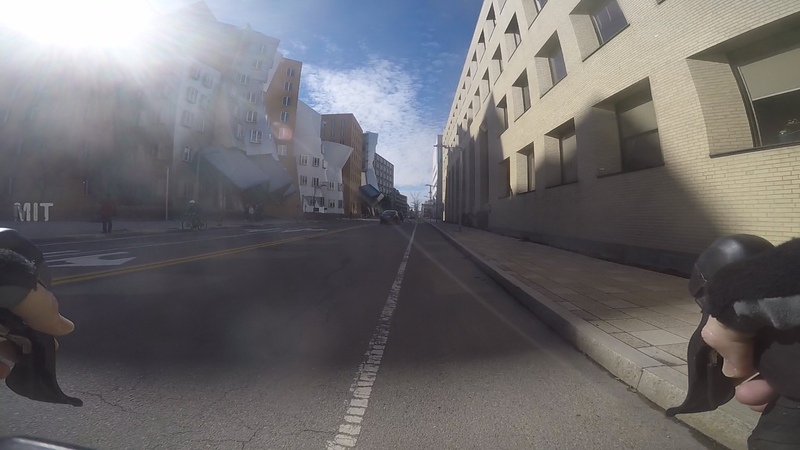 Monument Street: first climb of the season for this laggard. Enjoying the view from the top of the hill. Rod, nice ride report and pics. I've been meaning to ask, did you ride a bike to the Joe Val Festival this weekend? It would have been nice to converse more than just a quick hello but we were rather distracted. I thought about it, but balancing the beer cooler on the rear rack seemed a little dodgy. Nice set! amazing how much it slows down a bike, right? short winter, huh? 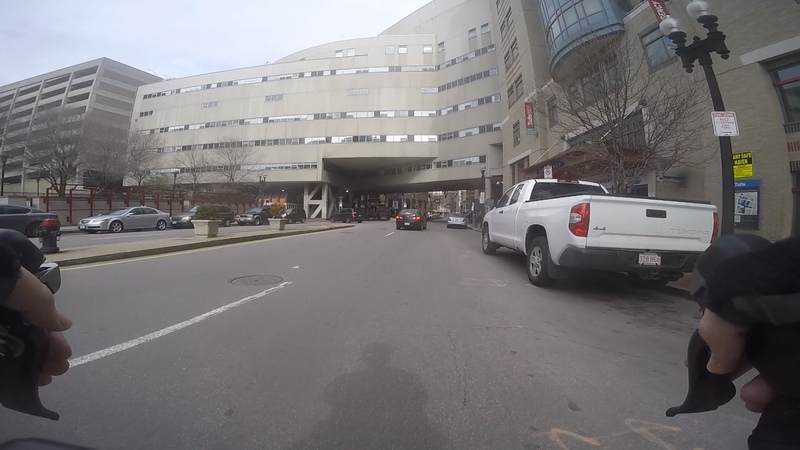 ... downright dreadful as is sections of Monument st in Concord/Carlisle. I equate them to bombed out runways. Especially in the dark where the 38's are managing them far better than the 25's or 28's on my road bikes. Despite zig zagging I've managed to hit a few. I can confirm the nasty pavement on Monument Street. I hit one pothole (concealed in shadow) at speed, no bad consequences due to the combination of 42mm, low-pressure tires and a very stable frame geometry, but it got my attention, for sure. Lots of lesser annoyances, and traffic was light enough to permit judicious line-picking.